In 2006, friends encouraged Manny Cinco and Nica Reyes-Cinco to market their home-baked pastries. Through the years, the couple received compliments whenever they served their oatmeal chocolate crisp cookies, biscotti Italian dipping cookies and other pastries during gatherings of Manny’s former Ateneo High School classmates at their home. With her passion in baking since she was a child in Bohol, Nica eventually came up with cookies as gift items and sold them to friends and relatives in the Christmas of 2006. Sales went beyond the couple’s expectation and inquiries poured in. Mita’s Bakeshop was organized into a formal home-based business in 2007. The “Mita’s” trademark name and slogan “Home Baking Inspired By Friends!” received its copyright from the Intellectual Property Office on the same year. The company’s website www.mitasbakeshop.com together with www.facebook.com/mitasbakeshop were published. From its first pastry item, the company has extended its product line that now include Cookies, Pastry Bars, Cupcakes, Cakes, Snacks and Kitchen Food. By 2008, demand increased as dealers sold Mita’s pastries in their outlets. This prompted the couple to set up a mini commissary equipped with a commercial oven and other baking equipment to further increase production. By 2009 additional bakers complemented production and R and D activities of the company. Marketing efforts included participation in seasonal “tiangge” and bazaars for further promotional exposure. The company received write-ups in various newspapers (Philippine Star, Business World, etc.) and features in the Yummy Food Magazine (Cozy Kitchens), Northern Living Magazine and Zen Health Magazine among others. Guesting and interviews in television include - ANC Shop Talk in September 1, 2009, ABS-CBN Umagang Kay Ganda in September 15, 2009, DZMM Teleradyo “Radyo Negosyo” in June 19, 2010, GMA-7 Unang Hirit in September 15,2010, Net-25 Homepage morning show, an informecial on Mita’s Christmas Pastry Gifts at the ABS-CBN The Filipino Channel (TFC Global) aired from November to January 2011, Spoon on Net-25, Oplan Asenso TV-5, a feature on Mita’s Christmas Pastry Gifts in the show “Balitang Europe” which was aired via the ABS-CBN TFC Channel last December 2011, feature and interview in Kabuhayan Swak na Swak (ABS-CBN Channel 2) aired November 4, 2012 and the 700 Club Asia (GMA Channel 11) aired December 13, 2012. Mita’s Bakeshop continues to develop new pastry products as it gains customer loyalty. 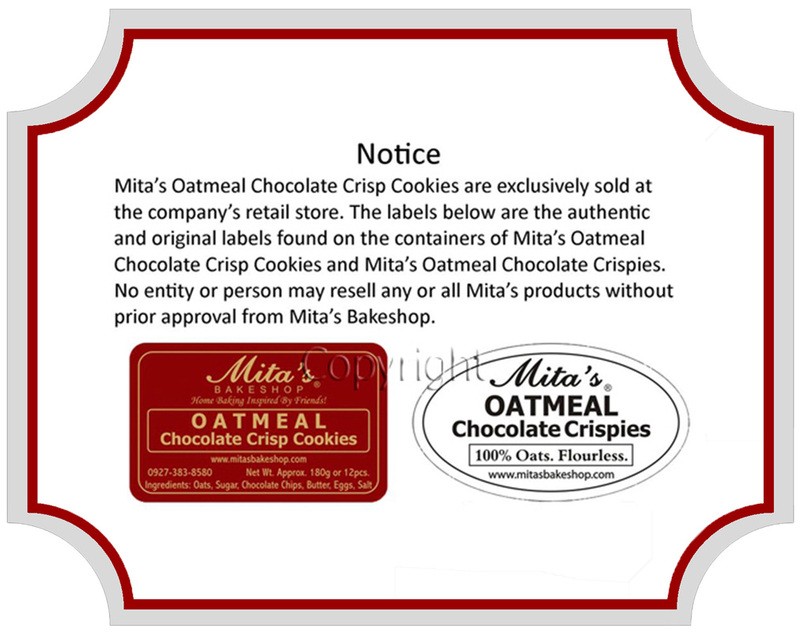 In 2013, the company’s first Bakery outlet opened to make available Mita’s products to its growing clientele. Mita’s Bakery is located a whisper’s distance from V. Luna Road and Kalayaan Avenue in Quezon City and a few minutes from Maginhawa Street, the city’s popular food street. ﻿Address: #23 Maginoo St., Pinyahan, Diliman, Quezon City 1100 Philippines. Prices are subject to change without prior notice. Packaging may vary in actual. 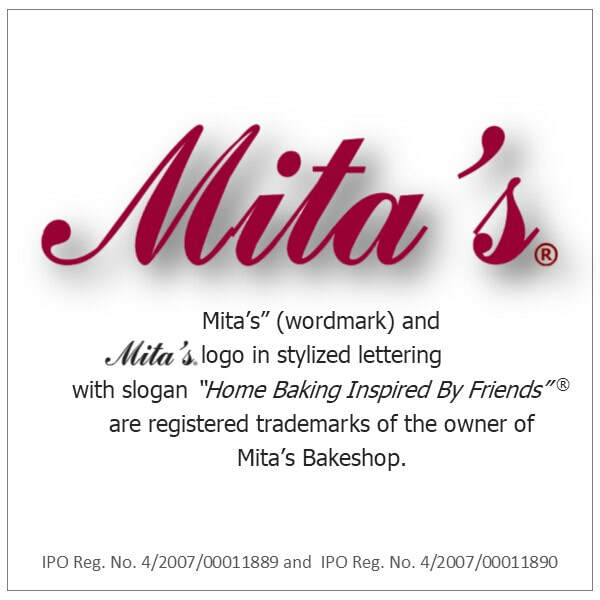 ® “Mita’s” (wordmark) and “Mita’s” logo in stylized lettering with slogan “Home Baking Inspired By Friends” are registered trademarks of the owner of Mita’s Bakeshop.